A knife-chill breeze whistled off the sea as Raidou helped Kimiko down from her harness. She stumbled a little in the dry sand, stiff-legged, but veered away from Genma’s supportive hand. Genma stood still for a moment, and then dropped it. Genma’s gaze sought the distance. “You can’t see our landing point because of the fog, but it’s about as far as we swam to get on this island.” He pointed to a thick bank of golden haze, and yawned. The contagion spread; Ryouma’s own jaw cracked. Soldier-pill energy still hummed in his veins, quickening his heartbeat like the fourth cup of coffee, but it was a poor substitute for sleep. He crouched on his heels to splash his wrists in the uprush of a broken wave. Cold water, gritty with sand, swirled over his skin. For a moment he wasn’t sure Genma would answer. Then Gemma’s gaze unlocked from the horizon, and he looked down. He was pale, bruise-eyed, with faint lines pinching between his brows, but he seemed to see Ryouma this time, and not just the mission. “Have you tried?” Kakashi asked. The tired lines creased between Genma’s brows again. He turned away from the water. Ryouma creaked upright after him. Kimiko and Kakashi had squared off under the sheltering overhang of the cliff. Raidou was sorting out sealing scrolls and grease-jars; Sango lay sleeping on the sand, well-swaddled. The brilliant light of early dawn threw their shadows against the cliff and etched Kimiko’s face with the stark anger of grief and exhaustion. “I just asked if the gills were functional or decorative,” Kakashi said, looking irritated. They’d wanted to kill her baby. It wasn’t the only jutsu she’d taught them, not even close to the only secret she’d betrayed. Ryouma thought of Intel and Team Thirteen still in Kiri, the files ransaked, the information stolen and planted. Fukuda had given her entire village to them, in exchange for Kimiko and Sango’s safety. “Grease isn’t enough?” Ryouma knew it was stupid as soon as he said it; Sango was tiny. She didn’t have the mass to keep herself warm, even with swimmer’s grease. Kimiko didn’t really, either; she was too thin, without her sister’s muscle or a civilian’s insulating fat. Could she even swim that far? “It would take a fair amount of chakra,” Genma admitted, but he didn’t look ready to back down. He stopped. Genma and Raidou were looking daggers at him, but Kimiko was staring at Kakashi, her mouth open, her eyes wide. She looked at their faces, the officers’ scowl, Ryouma’s guilt, and back at Kakashi. The mask, the dyed hair, the eyepatch. Her gaze fell to Sango, swaddled on the sand. She moved suddenly, with something of a genin’s trained speed and all of a frantic mother’s scramble, catching Sango up from her sandy bed and curling over her, making her own body a shield. She was shaking. Kimiko didn’t uncurl, didn’t even look up. She was clutching Sango so tightly the baby woke, fretting. Iebara had recognized Kakashi by his father’s fame; Fukuda had known him as the Hokage’s student. Ryouma tried imagine what bloody stories Kimiko might have heard, and came up with far too many. She shuddered, maimed fingers flexing through Sango’s soft hair, and said nothing. That strike hit home. Kimiko’s mouth contorted, on the edge of grief, then firmed. Fear and fury still wracked her face, but, slowly, she uncurled. She darted a glance at Kakashi, yanked her gaze away, and fixated on Genma. Genma nodded back, just as seriously, and shifted to give her space. Supine on the sand, without even opening his eye, Kakashi raised a silent thumbs up. Time was starting to move in that funny, elastic way it did, when too many hours had passed without sleep. It had been more than 48 hours for most of them, and Genma’s two short catnaps had been more for chakra recovery after working extensive medical jutsu than for actual rest. The soldier pills he and Ryouma had taken boosted their chakra and provided strong stimulants, but ultimately the human body needed sleep. There was a real risk that if they didn’t keep moving while they waited for Kimiko to nurse her baby, they’d nod off without meaning to. No one answered at first. Ryouma stared mutely at the sand, kicking at a partly buried stick so that it vibrated. Had it been that long? “I must have eaten since then, or I’d have one more bar— no, wait, I gave Kimiko-san one…” He met Raidou’s eyes. “It was the caves for me, too. We should eat.” He pulled one of the remaining bars from his pack and inspected the label. Apricot-oat — inoffensive and palatable; he offered it to Raidou. Raidou accepted it, added two more from his own pockets, and sat down in the sand next to his scrolls. Before he tore the wrapper off the first bar, he flipped open a metal case and thumbed back a soldier pill, swallowing it with a swig from his canteen. It had been a dangerous mistake. But Ryouma looked nearly gutted, as if he’d let Kakashi’s name slip in the heart of Kirigakure with enemy ninja surrounding them. Ryouma’s head bobbed, and he said, “Understood, Lieutenant.” But he sounded just as despondent as he had when he’d apologized. A tossed seashell smacked Ryouma neatly between the eyes. “You’d have dodged that if you weren’t staring at your feet,” Kakashi drawled. Kakashi would mock Ryouma and goad him into an argument to break his mood. Well done, Hatake. Kakashi looked like he was considering lobbing another shell. “You’re welcome,” Genma said. “Eat it before you fight with Hound, alright?” He didn’t wait for an answer. Dropping onto the sand next to Raidou, he pinched the bridge of his nose for a moment, checked to be sure Kimiko was still occupied with Sango, and then carefully peeled his own meal bar. He was just raising it to his mouth when Raidou’s hand dropped onto his shoulder. It rested there, reassuringly firm. Genma leaned against Raidou and let his eyes close. But only for a moment. Then he took a deep breath, cracked his neck, and polished off his bar in five quick bites. While the baby finished nursing, Team Six got ready to move. They stripped to their underwear, and Genma sealed their clothes into a scroll. Between the edge of Kakashi’s black tank top and his long-legged trunks, his skin was almost luminous in the mist-filtered sunlight. The others wore nothing beyond supportive black briefs. Kakashi greased up first, and then Ryouma took the pot, smearing handfuls of the thick, protective substance over his skin. When he’d finished his arms, legs, he worked over the front of his torso while Kakashi helped with his back. Raidou and Genma did the same for each other, and then they turned to Kimiko. She stripped perfunctorily, then bent to unswaddle Sango. The baby’s eerily blue skin was quickly hidden under the protective grease. When Kimiko was finished applying the grease to herself as well, she nodded at the bundle of her own clothes and Sango’s blankets. “You can pack those,” she said. Genma cursed himself for having sealed their clothing scroll already. He keyed it open, laid everything out again, this time with Kimiko’s belongings as well, and focused his chakra, feeding it through the script on the chakra-sensitive paper. His soldier-pill fueled chakra was still holding steady. The jutsu caught and flared, and their belongings were pulled into the sealing dimension with a soft crackle, leaving only the tightly rolled scroll on the sand. Raidou and Ryouma had fashioned tow ropes for themselves, with large loops to go over their shoulders so they could pull Genma and swim hands-free. Genma turned to Kimiko. “We can harness you to my back with the baby to my chest,” he said. “I’ll carry her like I did with Namiashi,” she countered. Kimiko nodded reluctantly, but refused anyone’s help. She secured the squirming baby snugly against Genma’s chest with the carrying sling. While she prepared to climb into the her own harness again, Genma looked down at the fuzzy-headed infant. Sango tipped her head back at just that moment, open mouthed and smiling, and grabbed for Genma’s chin, hooking her fingers into his mouth. For a bewildered moment, Genma stared at the happy baby, and then Raidou and Ryouma secured their tow ropes to the harness, and helped Kimiko onto Genma’s back. She was light, even for a civilian. Looking at her, it was clear she hadn’t had enough to eat in some weeks, but it wasn’t until Kimiko was on Genma’s back, with her bony joints pressed against his body, that he was really aware of how malnourished she was. The baby was plump — Sango must have been taking every spare calorie from her mother when she nursed. “Got it.” It took Genma, Raidou, and Ryouma working together to cast an air bubble large enough to enclose Genma, Sango and Kimiko, and even so Genma’s legs and Kimiko’s feet were exposed. Icy foam swirled around their ankles. Kakashi cast his own bubble and sank beneath the waves. Ryouma and Raidou followed suit, with the tow ropes slung across their chests. Genma shunted chakra through the coils at the base of his brain to trick his hypothalamus into creating a rapidly spiking fever, and ducked under the next breaker. The undertow dragged his feet out from under him. Genma threw a hand reflexively over the baby’s head. Kimiko’s fingers clawed against his shoulders. The two ropes went taut, and then Raidou and Ryouma were swimming, pulling them away from Aoshima’s shore as fast as they could. Underwater cart-horse was a new experience. Except for the increased likelihood of being murdered by fish, Raidou quite liked swimming. The cold was a helpful brain-slap, and the exercise forced tired muscles to sharpen up and contribute. And, unlike running and scrambling and rock-hopping, it gave his knees a break. Most importantly, every kick took them further away from Kirigakure. The water was blue and shimmering, shallow waves turned rose and gold by the rising sun. Even when they got deeper, the visibility remained pretty good. He could see Ryouma pulling hard on his right, surging forward with clean, powerful strokes. And Genma behind them, head ducked over Sango, Kimiko clinging to his back — both of them kicking as much as the air bubbles and their entanglement allowed. Ahead, Kakashi was a shadow and a glimmer. The waves turned rough, breaking unpredictably over a long sand-bar. Raidou and Ryouma muscled their way through, fighting not to get yanked sideways or smashed down. Sand scraped Raidou’s feet— and then they were on the other side. The ocean floor fell away; open water stretched out ahead. A long, long way ahead. Raidou put his head down and swam. He and Ryouma were well-matched for a harnessed pair. Ryouma’s reach was longer, but Raidou was stronger; between them, they towed Genma at a steady pace, making good time. The work was warming. A repetitive, simple task that limbered and loosened tight, stressed bodies. He was almost starting to enjoy himself when Ryouma jerked, alarmed, and a massive shadow roiled by with something black-and-pale clenched in its jaws. In almost the same moment, Kakashi twisted around the shark’s dorsal fin and raked a blade across its gills. A dark cloud spilled into the water. The huge, muscular body spasmed. Kakashi shoved away before the serrated teeth could catch him, and jerked hurriedly aside when another, smaller shark flashed up from the ocean bed to rip a chunk from the bleeding shark. The water quickly turned into an ugly bloodbath, which swallowed Kakashi in the expanding cloud. Ryouma signalled an urgent question. Raidou twisted to answer and nearly had a goddamn heart attack when Kakashi popped up, unscathed, two feet in front of him and signed, Hurry up. Apparently that trick worked underwater, too. A sharp tug on the line made Raidou look back. Genma pointed at Kakashi and signalled, emphatically, No chakra! Kakashi shrugged one shoulder and held his thumb and index finger very close together. Just a little. Raidou hadn’t felt anything, but that was no guarantee Kiri wouldn’t. The bubble jutsu was already a risk. He scowled and jabbed Kakashi in the shoulder with two fingers, repeating Genma’s order. Kakashi’s air bubble rippled faintly, as if he’d sighed inside it, but he signed a reluctant acknowledgement and slipped away, armed with a knife and his personality against the ocean. If the ocean had a few more sharks, Raidou figured that was about even. They surfaced shortly after that to refresh their air bubbles. Ryouma sucked in grateful breaths, holding Kimiko up while Raidou braced Genma. The water was still cold, but Genma’s skin felt like warm coals, and his face was flushed. Raidou didn’t like the faint, feverish glitter in his eyes either, but Sango squalled and complained with healthy lungs, and Kimiko was only shivering a little. “How much further?” Ryouma panted. Raidou eyed the distant cloud-bank. It didn’t look any closer. When he craned his head, the shore they’d left was still visible. “Less than there was fifteen minutes ago,” he said. “I hope you get seaweed in your briefs,” Ryouma said coldly. They re-cast the jutsu, adjusted the ropes, and submerged again. The second stretch went without incident. A few shadows loomed close, but Kakashi — and once, Ryouma — drove them away. Out of the lava tubes and reefs, they were at least free of ambush hunters and small, hard to see predators. The sharks were dangerous, but they were easy to spot. The third and fourth surfacings brought the cloud-bank no closer. Fire rasped in Raidou’s lungs, but his fingers and toes were growing steadily numb. High color burned over Ryouma’s sharp cheekbones. Genma, increasingly quiet, just tipped his head back in the open air and breathed out heat. Kimiko’s sharp teeth chattered. Sango’s tiny fist wobbled through the air and bounced off Genma’s nose. He blinked and looked down at her cross-eyed. Her next attempt ended with her fingers clenched in his hair, tugging his head sideways. It took Kimiko’s irritable assistance to free him, but in the middle of the open ocean, Genma looked down at the tiny, grabby, improbable reason they were all here, and resolve chased some of the weariness from his face. He smoothed a hand over the fine, dark hair plastered to her forehead, and cast the air-bubble jutsu once again. Raidou and Ryouma added their own chakra, making it big enough. Incrementally, the clouds crawled closer. Kakashi blinded a shark and hacked some kind of weird, flat sea-snake in two. Raidou and Ryouma pulled, pulled, pulled. Kimiko stopped kicking. Her toes were almost the same color as her daughter’s. The next time they surfaced, Genma made her wrap her legs around his waist and cupped his hands over her feet. The next time they dived, he stopped kicking too. Blood in the water. Something with teeth. A flash of steel, and it was gone. Raidou breathed his own breath again and again, until the air was warm and tasted like metal. Swam with burning shoulders. Kicked with cramping feet. Cursed Kiri and its vindictive, salt-infested geography. Kakashi killed something else. Ryouma kept pace with stubborn, dogged determination. And then, miraculously, there was sand under Raidou’s feet. He kicked to the surface, took a wave in the face and tumbled back underwater. The rope snapped tight around his chest. Ryouma floundered in his peripheral vision, battered by surf. Raidou grabbed him by the wrist, hauled them both back to Genma, and managed to get everyone surfaced between the roaring waves. They staggered, half-crawling, onto the shore, and collapsed at the surfline. The sun beat down on Raidou’s back like a welcome hammer. Kimiko was coughing, sawing through ropes to get to her baby. Sango gave a thin cry. Ryouma groaned, relief and exhaustion twined into one low sound. Genma just breathed, panting at Raidou’s shoulder. One beat, two. Genma blinked slowly, closed his eyes, and let out a breath like a man putting the world down. The rusty pulse of chakra under his skin went out, and slowly, slowly, the unnatural heat began to bleed away. Genma shivered. Raidou wrapped an arm around him, chafing his lean shoulders, and thought, I’m never moving again. And what did it say about Team Six, that they listened? Ryouma shoved himself to his knees and hung there, swaying. Sodden hair dripped down his face. Sand crusted his skin. He drew a breath that seared in his lungs, and made it the rest of the way to his feet. He was never going to be able to use his shoulders again. Most of his soldier-pill chakra had burned away in the sea, molded into strength and endurance. He dredged up what little remained and stretched out his senses. Two hundred meters, three hundred. Nothing but scraps of life lit in his chakra-sense, sea-birds probably; he’d never been able to sense anything much smaller than that. He blinked. Refocused sight, instead of chakra-senses. And stared, disbelieving, at the jagged stretch of cliff erupting out of the thin beach before them. He sounded like he had a mouthful of sand. Possibly it was just a mouthful of Raidou’s chest. Ryouma’d have been jealous, if he weren’t so tired. The baby was crying again, thin and angry, but at least Kimiko wasn’t. Maybe she was too cold for it. Kakashi looped back, only a little unsteady, and poked his knife at Ryouma’s chest. Ryouma stared at it. Kakashi made a frustrated, snarling sound, grabbed Ryouma by the shoulder, and began cutting the water-swollen rope harness off him. Ryouma’s shoulders discovered a new level of pain. His skin was raw and bleeding where the rope had chafed, and cold-numbed nerves woke shrieking as Kakashi peeled the salt-soaked fibers away. Red-tinged water dripped in their wake. Kakashi scowled, and dropped the sawed rope lengths in the sand. “And you’re the one who’s bleeding,” Kakashi said, still glowering. He was probably recalculating Ryouma’s points at permanent negative 50. No pause even for rest or water; he was hauling Genma up, slither-footed in the sand. “Tousaki, carry Kimiko. Hound, take the baby. I’ve got the lieutenant.” He crouched to thrust his shoulders under Genma’s chest, careless of the ropes still blistering his own torso. Ryouma stifled a sigh, kicked sand over the ruined bits of rope, and went to coax Kimiko into giving up her baby. “I won’t drop my baby!” Kimiko snarled. “Me? Uh— Yeah, sure, I guess…” Ryouma creaked down to accept a greasy, squirming armful of unhappy baby. Sango wasn’t quite wailing yet, but she was making the sort of grizzling noises that threatened it. Ryouma braced himself, scooped a hand under her sodden diaper, and flopped her against his shoulder. The squirming settled a little, though the noises didn’t. Kakashi said, “We’re wasting time.” He crouched, offering his back to Kimiko. She clenched her jaw and clambered on. Her hands hovered near his throat, until she gripped her own forearms to lock. Raidou and Genma hadn’t bothered with harnesses, either, beyond the ropes still cross-hatching them both. As soon as Raidou saw the others ready, he turned toward the cliff-face. Genma huddled low on his back, reducing drag. Raidou set open palm and bare foot to the wave-smoothed cliff, and climbed steadily upward. Climbing without hands was easier, in a way — cliff-walking was a chuunin’s trick, in Konoha. The baby threw Ryouma’s balance off a little, though, and made him excruciatingly aware of his abdominal muscles. He glanced down once and saw Kakashi had followed Raidou’s example, spidering up the cliff-face with chakra-limned hands and feet while Kimiko clung doggedly to his back. They were a little slower than Ryouma, but not by much. Up, and up. The rock beneath Ryouma’s bare feet turned jagged, as they passed the point where even storm-surge might pound. He tried not to limp. Steady, even chakra flow, and steady, even breathing. The wind snarled around him, tugging him away from the cliff, then shoving him against it. Sand chafed in the seams of his wet briefs. Sango hiccupped unhappily on his shoulder. Raidou snorted, grabbed an overhanging vine at the top of the cliff, and hauled them both over. Ryouma was two steps behind, lurching with the abrupt transition from perpendicular to vertical. He crowded up a steep, lushly overgrown slope, trying to give Kakashi room to clear. He was so sick of caves. But Genma and Kimiko were both shivering, and they needed shelter. “You c-c-can let me walk n-now,” Genma said, as soon as they were on a relatively stable slope. The chattering, shaking chills were getting increasingly severe as the wind gusted across his sweat-damp bare skin and seawater-drenched hair. Kimiko shoved herself away from Kakashi’s back with blue-white hands, fighting to be on her own feet again. Kakashi let her fall without so much as a twitch. She landed awkwardly, stumbling backwards a few steps on the slick vegetation, but caught herself before she tumbled backwards off the cliff. She glowered at him from the wet scrub. “Hound,” Raidou said sharply, with a low rumble that promised consequences if Kakashi didn’t stow the attitude. Kakashi’s eye narrowed, but he ducked his head and looked away before it was a clear challenge. Raidou motioned Ryouma over, then crouched and set Genma carefully on his feet. When Genma’s knees threatened to give way, Ryouma caught him, broad palm splaying against Genma’s shoulder blade. With his own heartbeat pounding in his ears, and his fever-shot equilibrium far from back to normal, Genma had little choice but to lean against Ryouma and try to still his chattering teeth. Sango squirmed against Ryouma’s other shoulder, kicking Genma in the forehead with one sharp-nailed little foot. When she kicked again, Ryouma hefted her a little higher. Raidou set to work immediately, cutting their rope harness off, then unsealing their clothes and shoes from the scroll Genma’d packed for the swim. Kimiko snatched Sango’s dry swaddles from the bundle the second they tumbled free, then stalked over to demand her baby back. Ryouma relinquished Sango with evident relief, and shifted his weight to wrap his free arm around Genma’s shoulders, providing welcome support against incongruously cold skin. Before Genma or Raidou could answer, a shiver of chakra pressed against Genma’s senses, and he snapped his head. The heat of his own breath seared through his sinuses when Genma sighed and extended his own chakra senses carefully out. Nothing but them and the wildlife on this unfarmable end of the island. Thank the gods for Intel being right about this as an escape path. So far. “That’s why I checked first,” Kakashi said, clearly irritated. Raidou rummaged through the pile of clothing on the opened scroll to produce a towel, which he threw accurately at Kakashi’s face. Kakashi was just a beat late in attempting to catch or deflect it: it hit with a soft fwap against his sodden mask. “Settle down,” Raidou told him. He rose from his crouch and stood facing them, with his back to the lush volcanic landscape. “Look, it’s been a long couple days and a worse few nights. We’re tired and stressed, and we’ve lost people — Kimiko especially.” His gaze lingered on her and the baby a moment, letting that sink in. Kimiko’s face could have been carved from stone. Kakashi obliged, sending a stream of water jetting towards Raidou. Grease and sand peeled away, leaving Raidou’s skin pink in its wake. Old scars stood out raised and silver in the sunlight, contouring hard muscle like an artist’s drawing. The sand on his own skin chafed where it rubbed against Ryouma’s. Genma glanced up to find Ryouma thin-lipped, every line of his face etched with exhaustion. “Us t-too,” Genma declared. The cold water would be dreadful for a moment, but getting the grease and sand off would be more than worth it. He braced himself for the blast, but when Kakashi turned the shower on them, it was gentler, and not nearly as icy as Genma’d expected. He and Ryouma both had to scour with their hands to get anything like clean. Without soap, it was just a rough approximation. Even with tepid water, the shower dropped Genma’s temperature fast. The chills hit harder, and Ryouma took over entirely, bracing Genma with one hand and scrubbing his skin with the other. While Kimiko and Sango took their turn, Genma huddled close to the ground and let Raidou and Ryouma together towel him off and help him into dry clothes. His joints and head ached as if it had been a real fever, and the shivers, though less violent now that he was dressed, continued. Raidou regarded him for an unimpressed moment, before he dropped the towel directly over Genma’s head — his answer, it seemed, to shinobi under his command behaving in ways he disapproved of. “Everyone ready? Yes?” he asked. When no one disagreed, he said, “Good, let’s march.” He gave Genma a hand up while Ryouma did the same for Kimiko and Sango. Kakashi resealed the scroll and stowed it. Genma didn’t bother with a protest when Raidou insisted on slinging an arm under his shoulder to steady him as they walked. They were a slow, mostly silent band, climbing through clinging brush and loose volcanic soil. Sango, securely in her mother’s arms again, dropped off to sleep. When they finally made it to the safety of the caves on the ridge, even Kakashi seemed relieved to be able to rest. Today’s cave of choice was a smooth, black-walled volcanic afterthought. The opening was narrow, but once they were inside the ceiling stretched up enough to allow sufficient headroom. Even Ryouma didn’t have to crouch. It was really more of a tunnel than a cave, sloping deep into the mountain, bending around and out of sight. The dark, rippling walls put Kakashi in mind of a dead artery. On the balance, that was still better than a landslide. Also, he needed to stop using medical textbooks for bedtime reading. He cracked a light-stick and jogged reluctantly down to the end, investigating for enemy boltholes and creatures of either an edible or poisonous nature. The cave ended in a closed fissure, remnant of some long-ago lava episode. Kakashi touched a basalt edge and gently feathered his chakra through it. Stone, stone, and more stone met his senses. It radiated a solid, patient air, as if it had sat here for hundreds of years and was content to sit for a hundred more, instead of, say, collapsing on someone’s head today. On the way back, he scooped up a colorful, many-legged specimen with interesting jaws to befriend the first person he judged deserving. It spent the return journey trying to eviscerate his sleeve. Near the mouth of the cave, Genma had selected a flat spot in a patch of sunlight to collapse on. Ryouma sat cross-legged next to him, stretching one shoulder and then the other in sequence, trying to fight an ocean’s worth of knots out of the muscles. Raidou knelt next to a brace of scrolls, extracting water canteens, instant meal pouches, and bedding supplies. Kimiko had retreated further into the cave, where she’d turned away from everyone to feed Sango. She didn’t acknowledge Kakashi when he jogged by, but her shoulder hitched higher, pouring more shadow over the baby. Since the cave contained a complete lack of burnable items, Kakashi headed back outside to source something. Genma opened one eye when Kakashi passed, but otherwise didn’t move. Ryouma yawned. Sticks for kindling, moss for tinder, bigger branches for long-term burning. Surprisingly, for the Land of Endless Damp, he was able to find enough dry material to work with. When he returned, Genma had a half-empty water canteen in his hand and a folded blanket under his head. Ryouma was chewing on a strip of dry jerky. Kimiko had re-wrapped her shirt and was holding Sango against her shoulder, gently thumping the baby’s back. Raidou was making a bedroll up near her, with an additional blanket laid out to make a new baby-sling. Tinder, kindling, branches. Flame. Kakashi fiddled with the campfire until it burned smokelessly. Then he set up the captain’s iron tripod and kettle over it, dumped water in the kettle, and lay down on the smooth, preciously horizontal rock next to the fire in the hope that his entire body would stop feeling like an overplayed harp-string. The ceiling was black and cracked with jagged fissures. Kimiko, further back in the cave, had snapped her head up at the noise. Realizing the source, she settled back down and grimly resumed burping Sango. Genma took a deep breath, regarding Kakashi and Ryouma in turn, and rolled away on his side so he didn’t have to look at them. Raidou was preparing something that smelled meaty-savory, and ignoring them all. Carefully, Kakashi removed the twig and relocated the bug to the cave wall, where it scuttled up into a dark crevice and vanished. Ryouma watched the crevice suspiciously. Tangled near Genma’s knees were a mass of scrolls, kits, and supplies that Raidou had unsealed but not finished organizing. Kakashi leaned over to hook out Ryouma’s, distinguishable by old black rot-marks that hadn’t fully washed out. Ryouma waved a silent explanation at Raidou and staggered out of the cave. Kakashi trailed after him. The sun was high and hot, scattering rainbows through patches of silvery mist. A salt-laden breeze washed over Kakashi’s skin. The air smelled like ocean and greenery. Ryouma found a rock, sat down on it, and pulled his shirt off like it had personally offended him. He gestured for his kit. Kakashi tossed it over, and lay down in the grass. The sun spilled warmth down on him, while Ryouma hissed and swore quietly at gauze. A sharp bite of herbs made Kakashi wrinkle his nose. He glanced up and watched Ryouma doctor himself with a pale green salve. “I should have known you didn’t kill Fukuda,” Kakashi said. So had Kakashi. You couldn’t help admiring someone that strong. It was funny, what you could feel about someone else’s traitor. “What actually happened?” he asked. Kakashi pushed himself upright as Ryouma spoke, bracing one hand against the grass. Of course she did. Of course he had. Sango gone, Kimiko frantic. They wouldn’t have hesitated. Kakashi glanced back at the cave, but the entrance was angled away. A small, cold part of him remembered dropping Kimiko at the cliff edge, and wanted to bite itself. He brushed it away; Kimiko wouldn’t welcome or want his apology. Ryouma had rotted a pig carcass to black sludge, and a proctor had buried the remains. So, an unmarked grave near a sewer culvert, without even bones to fill it. Kirigakure would never know where they could go to spit. “You’re probably allergic to it,” Ryouma said grimly, but he finished taping his bandages, tugged his shirt back on, and slipped down off his rock to lie in the grass. After a moment, he let out a low, soft sigh. Unbidden, Kakashi’s thoughts went back to his ANBU interview. If Konoha ordered it, I’d kill every innocent between here and Iwagakure. They hadn’t asked him what he’d do afterwards, though. Two hundred and fourteen. Ryouma stayed silent. On a good day, Ryouma would never win a prize for his poker face. His mouth was parted on an indrawn breath. His eyes had darkened, anger flaring overtop something very young, and very sad. It wasn’t hard to look at his face and think of a younger, dark-haired boy, once again hurt that the world wasn’t fair. I think the White Fang is a hero! Obito’s first and only battlefield kill. Kakashi looked down at his hand. The little white scars on his fingertips, where he’d ripped them open trying to lift a mountain. Whatever the village may say, you’re a great jounin, Kakashi. So please accept it. Ryouma’s mouth opened, and closed, without words. They seemed to have choked up into a tangle under his sternum, aching in his throat. He reached out instead, and touched the side of Kakashi’s hand. Kakashi went still. Ryouma’d seen him do that before, when startled: every muscle tensed on the cliff-edge of action, even breath held curling in his lungs. He looked down, after a moment, to the brush of their hands in the grass. Then he tilted his head to look at Ryouma, the faintest arch of a question in his eye. He could feel the hard edge of bone under his fingers, the roughness of scar tissue built over knuckles and the striking blade of the hand. Metacarpals: Kakashi had taught him that word. They had a flashcard for it, somewhere. Kakashi’s skin was beginning to warm, finally, in the sun. Kakashi looked down at their hands again. “Sorry.” Ryouma pulled back, but Kakashi’s hand turned, knuckles against the grass, palm curved. He caught Ryouma with the crooks of his fingers, very lightly. Ryouma stilled. He could feel scars cutting through the pads of Kakashi’s fingers now, calluses from sword or tanto, the ridges and valleys of lines in Kakashi’s palm. “I wasn’t trying to—” he said, and stopped. It shouldn’t have. I wish I could. Sun-dazzled silhouette resolved into broad shoulders, an armload of firewood, and a bemused smile. They made a slow trek back. Genma was still stretched out in his patch of sunlight near the mouth of the cave, but he’d been wrapped in blankets til only a pale slice of exhausted face showed, under the tangled tumble of his hair. The hectic flush had burned away from his cheekbones, leaving shadows like bruises under his eyes. Ryouma tried to step more quietly. He found himself holding his breath. Further inside the cave, Kimiko curled in another bedroll, with Sango snuggled drowsing against her breast. Kimiko’s eyes slit open, then drifted closed again, as if even the effort of apprehension was too much for her now. Several empty ration packs lay in a tidy pile near their sorted gear. Raidou had three more ration packs heating. On the tripod, the kettle was just coming to its second boil. Ryouma made tea. They dumped pouches of rice into packets of mackerel and pork in sweet-and-salty sauce, and Raidou produced dented metal spoons. They ate, cross-legged in the sunlight at the cave mouth, quiet so as to let Gemma sleep. Clouds rolled in. The mist came down. Raidou and Ryouma scraped up their chakra and set shadow clones to guard. Kakashi fell asleep, head on a rock, curled tidily near Ryouma’s knee. The cave-creature with too many legs hadn’t come back yet. Ryouma leaned back against the rough wall of rock and let himself drowse. “I don’t think he had the choice,” Ryouma said. He had to look farther down than usual to see Hitomi-sensei; he’d grown again. 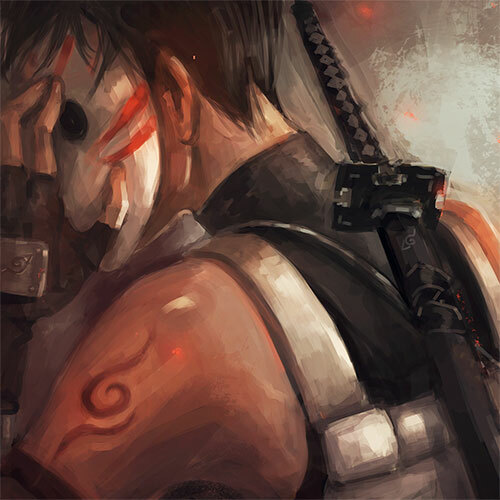 He was adult now, in ANBU blacks, with tattooed arms. Hitomi-sensei said, “You never think. That’s the problem.” She put her eyes back in and went away. Kakashi said, “You throw away all your chances.” His red Sharingan eye spun like a child’s pinwheel. His mask was red too, but it wasn’t a mask, it was blood. Blood glued his lips together and coated his collarbones. His grey eye was gone; a tiny ghost-white crab crawled out of the hole and scurried beneath Ryouma’s boot. Ryouma stamped in reflexive horror. The shattered crab became two, then four, then a scuttling sea. Kakashi said accusingly, “Look what you’ve done. You owe me an eye.” He stretched out a hand. The thing on the ground was Genma. Blood leaked from his mouth, thick and black, clotted with the last liquefying shreds of his lungs. Raidou held out a kunai. “No,” Ryouma cried, and jerked awake. Grey light gleamed cold through mist. He sat braced against clammy rock, with a sharp pain in the back of his head and his heart thumping against his ribs. Kakashi slept curled at his knee, undisturbed. His clean cotton mask shrouded mouth and nose, and left his scabbed cheekbone and a stubble-sheened slice of jawline bare. A few meters away, Raidou bent over Genma, shaking his shoulder. Genma twitched and mumbled, lashes fluttering against his cheeks. Raidou shifted his grip, pressing his thumb into the soft skin under Genma’s ear, and Genma jolted violently up with a knife in his hand. Genma’s gaze sharpened. He tucked the knife away and pushed blankets down, ready to rise. Ready to shoulder responsibility for their team, for Ryouma, for Kimiko and her baby, for a woman he’d had the courage to kill. Genma pushed sweaty hair off his brow, watching him. “I’ll make sure to word it that way on our mission report,” Genma said, folding blankets with quick, jerky movements. Raidou huffed softly, and reached for a sealing scroll. Kakashi’s good eye flickered open almost before Ryouma touched him. “Five more minutes,” he said, and folded an arm over his head. “Unless you are a blanket or hot tea, go away,” Kakashi said, without moving his arm. “Kick him if you have to, Tousaki,” Raidou advised. “Nothing. You’ll have to make the tea.” Ryouma pushed himself up, and went to go wake Kimiko. She’d cried in her sleep. Tear-tracks crusted her face when she woke, before she scrubbed them away. But she seemed a little steadier, quiet but less brittle; she even relinquished Sango to Ryouma’s care briefly while she retired to the nearest dense shrubbery. By the time she returned, Genma had the rest of the blankets packed, and Kakashi’d pried himself up to begin making tea. Twenty minutes later, they were on the move. Raidou carried Kimiko again, his abused shoulders unbending beneath her slight weight. Ryouma found himself promoted to babycarrier. He didn’t see why a rot-handed man who’d never held a baby before was any better option than the shinobi who’d kept Sango safe from eight Mist Hunters, but he didn’t argue. Mist had thickened while they slept. Genma climbed a tree to take bearings, then directed them south-east in an angling skid down ridges and through ravines. Thick vegetation slowed them further. The pearl-grey mist muffled sound as well as light. When a drove of young wild boars stumbled into their path, Ryouma wasn’t sure whether pigs or shinobi were more surprised. The light faded as they made their slow way toward the coast. They halted once for Kimiko to feed Sango, and then again. Genma plied Kimiko with rat bars and kept a worried eye on her canteen. She ate and drank dutifully, and swallowed down any complaints. Sango burped sour milk down Ryouma’s shoulder, and then fell asleep in her sling. A river cut through their path, hurtling downstream in whitewater too rough to chakra-walk. Kakashi vanished ahead to scout out a crossing, and came back reporting a narrowing canyon dotted with just enough boulders for a scattershot of chakra-assisted leaps. They tightened the knots on their carrying harnesses and took the risk. They climbed, breath rasping harsh in their chests. Loose, rocky soil turned slippery under their feet, but the dark curtains of rain shredded away on a freshening breeze as they reached the skyline. A rising moon filtered through the clouds, silvering the world below. Below them, thick mountain greenery plunged steeply to a narrow-mouthed, sheltered inlet. Black water, blacker trees, with waves cutting a glimmer of white at the shoreline. “Satsujin-sha Cove,” Genma said, in a voice like a prayer. Low on the waves, dragon-wing sails furled, a familiar junk rode at anchor.